Around the world, millions of people have added their voices to protest marches and demonstrations because they believe that, together, they can make a difference. When we failed to stop the genocide in Rwanda in 1994, we promised to never let such a thing happen again. But nine years later, as news began to trickle out of killings in western Sudan, an area known as Darfur, the international community again faced the problem of how the United Nations and the United States government could respond to mass atrocity. 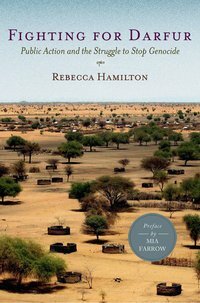 Rebecca Hamilton passionately narrates the six-year grassroots campaign to draw global attention to the plight of Darfur’s people. From college students who galvanized entire university campuses in the belief that their outcry could save millions of Darfuris still at risk, to celebrities such as Mia Farrow, who spurred politicians to act, to Steven Spielberg, who boycotted the 2008 Summer Olympics in Beijing, Hamilton details how advocacy for Darfur was an exuberant, multibillion-dollar effort. She then does what no one has done to date: she takes us into the corridors of power and the camps of Darfur, and reveals the impact of ordinary people’s fierce determination to uphold the mantra of “never again.” Fighting for Darfur weaves a gripping story that both dramatizes our moral dilemma and shows the promise and perils of citizen engagement in a new era of global compassion. ...Fighting for Darfur is a vivid account of how a vicious conflict in a forgotten part of Africa came to define an international movement to stop mass atrocity. Rebecca Hamilton captures brilliantly the passion and commitment of the Save Darfur movement, but is also cool and clear-headed about what went wrong. She is especially strong on the ever-present risk for any mass campaign organization of over-simplifying multi-dimensional and ever-changing situations. Fighting for Darfur is the story of missed opportunities and unintended consequences. It’s also a timely call for more realistic and more effective approaches -- by policy makers and citizen activists alike -- as Sudan enters a turbulent transition that threatens the people of Darfur and beyond.